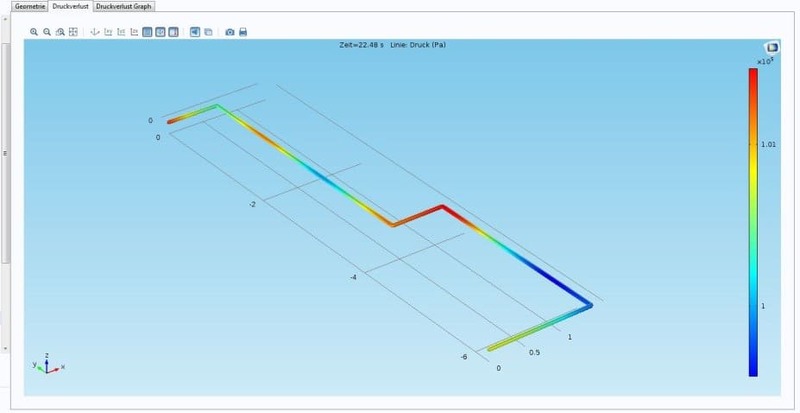 Is a Comsol Server App the right solution to carry out regularly required pressure loss calculations in simple pipeline networks? Our client wanted software in the form of a Comsol Server App in order to be able to quickly provide his boss with information on regularly recurring pressure loss calculations in line networks. Our client manufactures special components (details confidential) in which coolant flows. Each component has one outlet and up to 20 outlets. The mass flow of the coolant is divided in the component according to the pressure loss. Ideally, the coolant must be distributed in such a way that all sub-sections are optimally cooled. So far, the design has been based on the feeling and experience of the designers. Motto: “Somehow it was always possible. After the design, prototypes were built and tests were carried out. If it turned out that the cooling was not optimal, corrections were made and new tests were carried out until the result was acceptable. This procedure is no longer up to date, and the client wanted software that would allow the designers to carry out a systematic design. 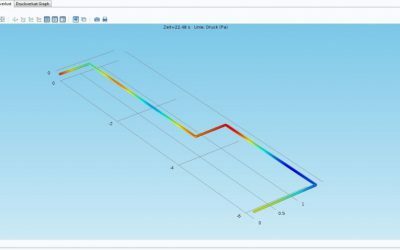 A Comsol Server App is optimal to combine the advantages of highly complex Multiphysics software with the advantages of individually created software. We have created a pre-configured Comsol Server App for the client, with which he can achieve the required results with a few simple steps and little computing power. The process is simple: the designer opens the app, selects the number of strands, defines the geometric parameters (e.g. line diameter and angle), specifies the mass flow and presses “Calculate”. The result is the pressure loss across all lines and the respective mass flow. If he is not satisfied with the result, he can change parameters due to the existing boundary conditions, e.g. from production, and thus approach the desired result. We would also be pleased to make this Comsol Server App available to you.